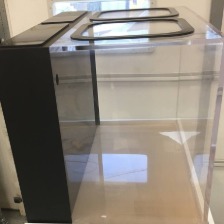 We can build a completely custom 1000 gallon aquarium (plus bigger and smaller sizes) based on any dimensions and any specifications you send us (the below tanks are just suggestions). That means tall or wide, acrylic or glass, anything. This is an example of the type of custom 1000 gallon fish tank that you can buy from us if you wish, however we can do any size or design you like. Every tank is made in the USA, and they are all made with acrylic to ensure that they are strong and will last a lifetime. Dimensions and sizes can vary as much as you like, as everything we build is completely custom and is decided by you.